:In the dusty, Islamic country of Sudan, Mia's life collides with that of another young woman. A young Christian American mother, Mia finds more than one dark secret on the streets of Khartoum. She finds Halimah, a young, upper-class Arab student with a bright future in her family's business whose risky and secretive decision has put her life in danger. What happens when the path of young mother intersects with that of a spunky Sudanese student? God transforms them both ...forever. 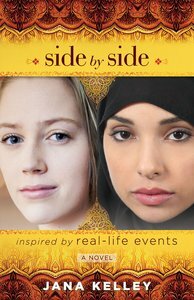 Part of New Hope® Publishers' contemporary missional fiction line, Side by Side opens the reader's eyes to the life of Muslims in Sudan as well as some of the struggles that Christians face when living under Islamic law. The reader will be inspired to pray for those who are persecuted for their faith as well as pray for the salvation of those who persecute.In the dusty, Islamic country of Sudan, Mia's life collides with that of another young woman. A young Christian American mother, Mia finds more than one dark secret on the streets of Khartoum. She finds Halimah, a young, upper-class Arab student with a bright future in her family's business whose risky and secretive decision has put her life in danger. What happens when the path of young mother intersects with that of a spunky Sudanese student? God transforms them both ...forever. Part of New Hope® Publishers' contemporary missional fiction line, Side by Side opens the reader's eyes to the life of Muslims in Sudan as well as some of the struggles that Christians face when living under Islamic law. The reader will be inspired to pray for those who are persecuted for their faith as well as pray for the salvation of those who persecute. Author of the captivating novel Side by Side, Jana Kelley is a Texan who hardly ever lives in Texas. Raised in Southeast Asia, Jana developed a love for cross-cultural living early in life. Her love for writing came soon after. Jana returned to Texas to attend East Texas Baptist University. She and her husband married a month after she graduated, and by their second anniversary, they were living in a remote African town. After 13 years living in Africa and the Middle East, Jana, her husband, and their three boys moved to Southeast Asia where they currently live. You can learn more about Jana at janakelley.com.